Verticordia: The Turner of Hearts. 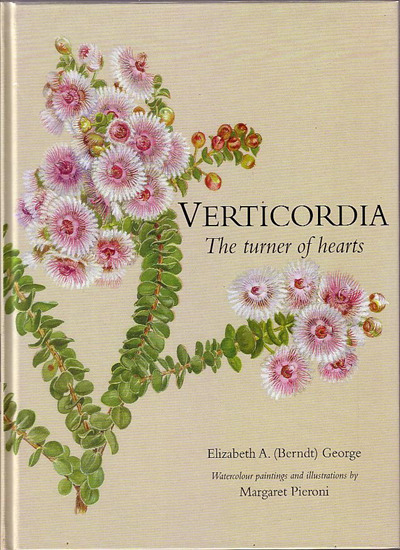 Verticordia:The Turner of Hearts brings together for the first time available information on all the described taxa of Verticordia (101 species, 13 subspecies and 30 varieties) providing a comprehensive, user friendly guide to their identification and cultivation. Presenting the species in a systematic sequence that allows for easy comparison and less confusion, the book also features:* guidance on when and where to look for verticordias in the wild*location maps for each species, subspecies and variety*historical information on their discovery, naming & cultivation*conservation issues*the use of verticordias in art and craft*a full glossary It is illustrated throughout with beautiful watercolours and line drawings by Margaret Pieroni, one of Australian's most talented botanical artists. Photographs of plants in their natural habitat are also included. Title: Verticordia: The Turner of Hearts.